The Iberian peninsula has been an interesting market for Cimbria for many years, not least Spain where, for decades, many customers in the agricultural sector have purchased Cimbria technology. In spite of the general economic challenges of recent years, investments in agriculture have not been affected to the same degree as in other areas, and the Spanish food industry therefore remains well-equipped to face the future. Farming in the area has always been — and continues to be — characterized by major regional differences in both structural and climatic conditions and variations that enable the production of a large range of agricultural products such as rice, vegetables, sunflower, olives, wine and fruit, as well as the more traditional products such as grain and maize, etc. On 1 October 2014, Cimbria set up a liaison office in Spain. 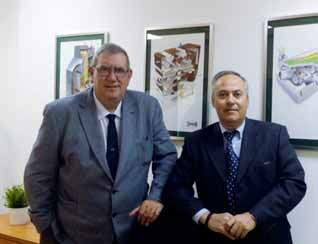 The office — Cimbria Ibe´rica — is situated in Valencia, and day-to-day management is the responsibility of Jose´ Sancho (Pepe) Gonza´lez and Ignacio L Pons Llopis. Thanks to many years of experience, both men are very well- known faces in the industry, and with their extensive knowledge of Cimbria’s products and process technologies, they are in a good position to provide expert advice to our current and future customers in Spain and Portugal.